I can't believe tomorrow is the first day of March. February sure has flown by! Don't forget to say, "Rabbit! Rabbit!" first thing after midnight and you'll have good luck all month, or so says my Malm. 1) So I've been watching Full House (best show ever!) on DVD and just started season 3 and it just so happens I was watching the episode where they get their dog Comet while I was making this animal-themed layout. What a co-ink-a-dink. 3) I made the brackets by folding a piece of yellow cardstock in half, drawing half a bracket with a pen then cutting it out. Voila - a full bracket! 4) No sewing machine used on this layout - shocking! 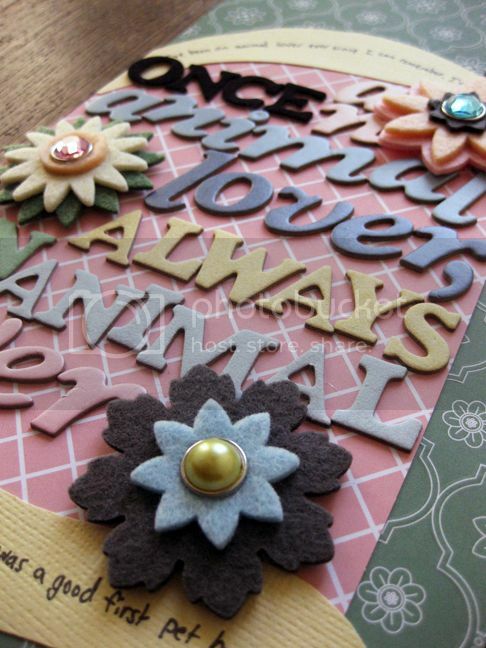 Journaling says: I've been an animal lover ever since I can remember. I've always had a plethora of pets to satisfy my daily need of human-animal interaction. My very first pet (besides fish) was a guinea pig named Tanmerry (pronounced "Tan-marie"). She was a good first pet but passed away right before we moved to Washington. This is me as a little girl feeding some cats a popsicle and such. 1) This is my all-time favorite picture of me as a little girl. I've used it plenty of times in my arts & crafting, and I stumbled across a whole page of them while searching for a picture to scrap. I just had to use it again. 2) I started by punching 40 scalloped circles from each of the new 24 patterned papers in the Botanique line (soooo pretty!) and used the fronts and backs of each paper. I punched smaller regular circles from most of the papers and adhered them on the same scalloped circles using thick foam dots. 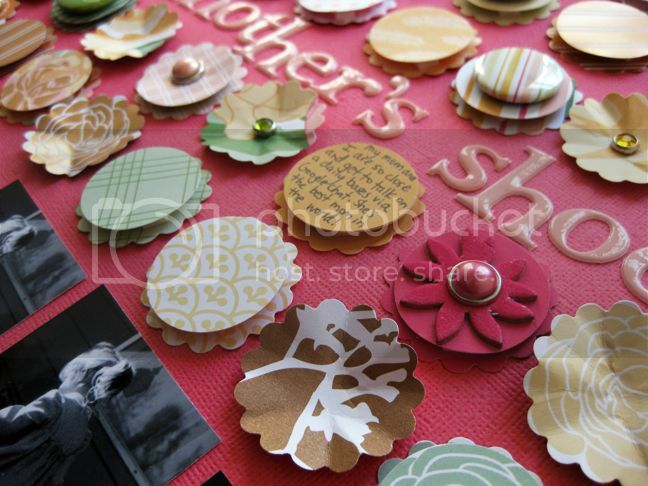 I embellished some of the circles with brads, chipboard flowers, Flair, and journaling. 3) I wanted the title to be "Walking In My Mother's Shoes" but it was too long. Oh wells! 5) No stitching on this layout either! What's happening to the world?!?! I wanted to go over the scalloped circles that don't have any embellishing on them with white stitching, but after visualizing it in my mind's eye, I decided against it. But don't you worry, I WILL bust out my sewing machine soon enough. It's addicting. Journaling says: I'm so glad that my mom took these pictures of me as a toddler walking in her high heels. It just proves how much I love her and how I've always wanted to grow up and be exactly like her. I'm so glad that my mom and I are so close and get to talk on a daily basis via Google chat. She's the best mom in the world! I love everything about this layout! You make the cutest stuff! Beautiful layouts Paige - I wish I could give up the sewing every now and then but I am addicted to it. Maybe there's a self-help program....never heard that about 'rabbit rabbit' but I will certainly give it a try! I LOVE this!!! 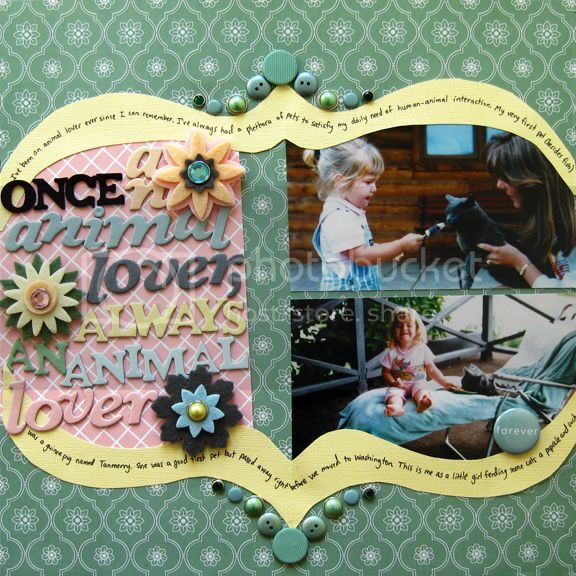 The photo is adorable and of course all the cut-outs are cute too! This is a great layout Paige! love love love and love more! the layouts are so gorgeous. wow! Paige wow... such fabulous pages and so much great detail! How sweet, Pailge! I love that you have the same smile in the picture where you're feeding the cat on the warner's balcony (you were two years old) as when you're eating out at Cafe Rio as an adult. I love being your malm. 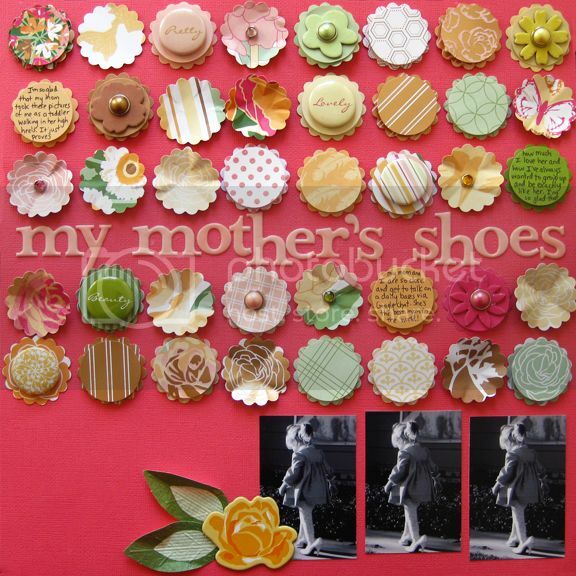 paige, "my mother's shoes" is beautiful and so heartwarming!!! I adore the design and the picture of you is so precious. Right now my daughter is really into wearing my heels around the house... you've inspired me! Did you know those are the shoes I wore on my wedding day? That Mother's Shoes layout made my eyes pop out of my sockets!!! I'm SERIOUS! That layout is AMAZING! I love the way you did the title too in the first layout. Both are beautiful! Love these!! Such sweet pics and great layouts! !